W6e offer Solar Mobile Chargers. 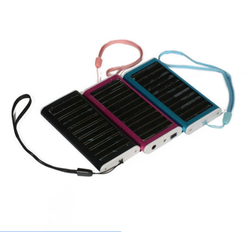 Solar charger employs solar energy to supply electricity to devices or charge batteries. They are generally portable. Mobile phones are one of the highest used accessories and business equipment, and it is always wise to have your mobile phones battery charged. When not charged, one could face a business loss. We are in compliance with various industrial standards and offers features such as enhanced durability and high quality. 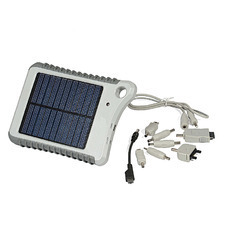 We offer Solar Mobile Charger (Heavy Duty). We have stepped towards unlimited success and the credit goes to our entire team who has spent their time and efforts to make us stand in stiff market place. Indication: charging and discharging state. We at, Solar Universe India are a concept marketing based company, introducing high quality products new to the Indian markets such as solar products (with a range of over 100 products. 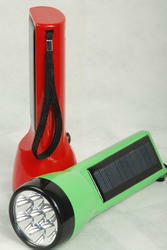 Our Solar and Dynamo LED Flashlight are acclaimed for their high utility and extreme robustness. We have due to our focus on quality of products, customization, process and service levels, our highly skilled service has been acclaimed for its minimal cost, as compared to competitive products that otherwise would have to be frequently replaced. 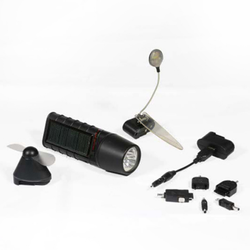 A dual functional product giving Solar Mobile Charger as well as a light source, in case of electricity failure. Adjustable solar panel wings to capture sunlight. 3 super bright LED lights. Up to 70 minutes of charge time on a mobile and up to 35 hours of torch light. 3 Modes to choose from, high beam, low beam or flashing mode for torch. Comes with 7 different Mobile connectors. We have gained international acclaim due to our strict qualitative parameters in the manufacturing of these products. The raw material we use is procured from some of the most renowned and reliable vendors and is stringently tested for quality before being used in the production process.